Summer Preview 1.05: Proof of Stremf! Build 1.05 is ready! More enemy Champions than ever before prowl the depths, and defeating them will earn you a Proof of Stremf, a trophy you can carry proudly back to the Academy! Collecting these trophies allows the Academy Battlemaster to upgrade your base stats! Best of all, each trophy goes toward a permanent running total that can be used by future graduates! Dungeonmans Summer Preview is Live! Here’s the link to the latest version of the Dungeonmans Summer Preview! The build is Windows only and uses XNA. If you need the XNA binaries they are here! This a pre-alpha preview of a game in active development! There will be bugs, missing assets, and incomplete features! But there will also be plenty of monsters to crush and loot to be scooped up by the handful. Please take advantage of the in-game Feedback window and send in your thoughts, observations, bug reports, or other ideas. Development of the preview build will be ongoing for the next few weeks, check for updates often! Dev Update 23: One more week! If all goes according to plan, the Dungeonmans Preview Build will be available to you here next week. Knowing game development, that likely means 11:59 PM on the last day of the week, but I will strive to do better. So yes, work continues at a most unhealthy pace, but I can’t pretend that it isn’t exciting. 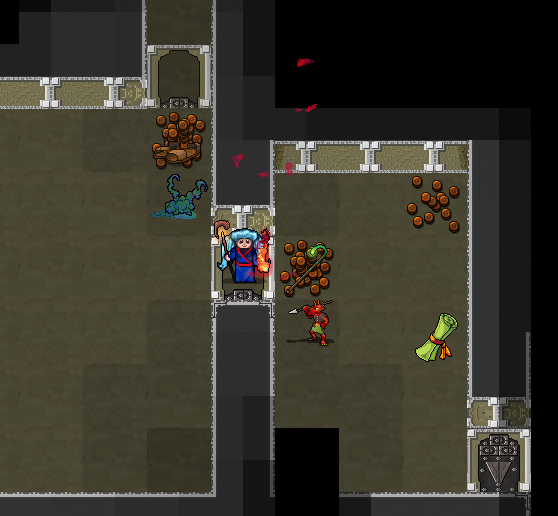 Seeing all the good old Dungeonmans monsters back in action after a long hiatus is really motivating. To get most of the new combat systems up and running, the way monsters stored information and calculated attacks had to change drastically. That meant that old monster data from 2010 Dungeonmans no longer worked. Once I got the systems working well enough to be able to fine tune them, I knew I’d get those old beasts back into shape. 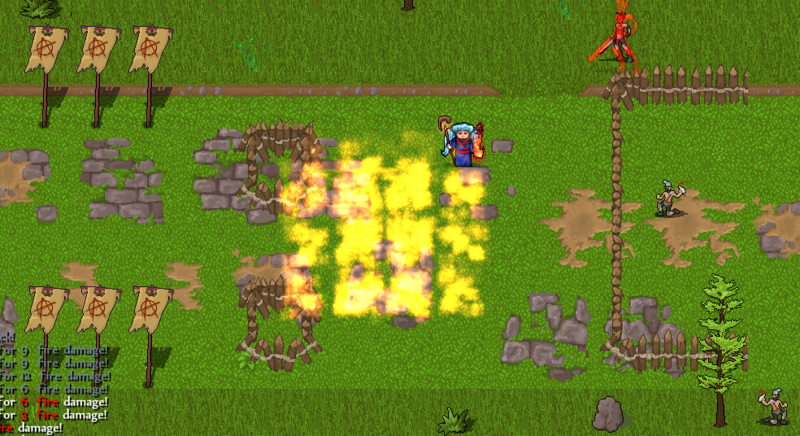 Now I’ve been able to add more ability and creativity to both the monsters you fight as well as the items you loot. Take a look at the rings below. Magical gear can have lots of things attached to them. Usually it’s based on random rolls, like finding a [Prefix] [Gear], like Flaming Longsword or Frosty Hat. There’s plenty of room for unique items though, and these are two of them. Rings are the wild card gear right now. 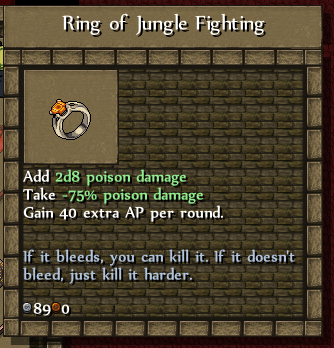 Early tier rings may seem pretty tame, but near the end some of the more rare rings are quite powerful and can even go so far as to give your Dungeonmans new powers while wearing them. 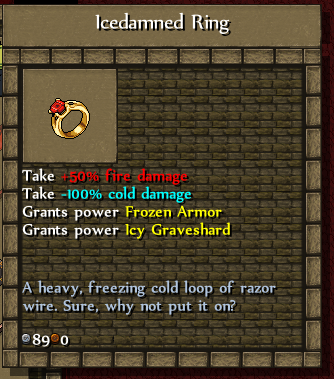 In fact, the Icy Graveshard power is normally reserved for monsters, and right now this is the only way to get it. Surely no one at the academy would teach a power so clearly outside of the curriculum, right? * Actions of any type take 100 AP. * When you have less than 100 AP, you’re done acting. * Once all active creatures are done acting, everyone gains 100 AP and the next round begins. Which means you end up with an extra action every few rounds. Not bad! Now, one of the questions I’ve heard is “But a dagger is much faster than a greatsword, why do they both take the same AP?” and that’s totally fair. 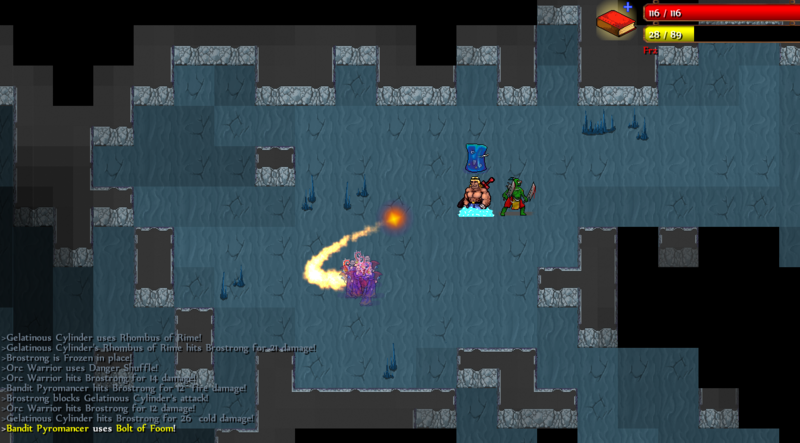 I think that’s a great mechanic and lots of other roguelikes use it to their benefit. For Dungeonmans, I’m aiming to keep speed equal in almost every fight. Some enemies have haste buffs or slowing debuffs, and sometimes you’ll get an edge with speed, but speed getting out of hand often becomes the deciding factor in a lot of fights. I’m aiming to have positioning matter in Dungeonmans combat, and that matters much less if you can take three actions for each one action by the enemy. Here a battle rages in the twisty tunnels of an underground cave! 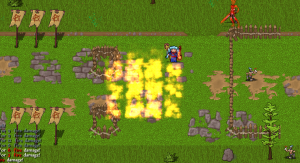 The Bandit Pyromancer (buffed by his Villain Cloud) is fooming with impunity upon poor our Dungeonmans. The Gelatinous Cylinder froze him in place, which means he can’t simply walk out of the tile. He can fight, use movement powers to break free, or just wait a few rounds until it ends. He really wants to close in on the Pyromancer, but that Orc Warrior next to him is going to keep up, landing Danger Shuffle when he can, which is an attack that switches places with the target. That’s all I got for now, I need to get back to work! Dev Update 22: It’s Not A Trap! Dungeons have traps, right? They have monsters, treasures, and traps. Some metaphor goes in here, about a three legged table or a peanut butter and jelly and marshmallow sandwich. Dungeons have traps! Except for the ones in Dungeonmans, right now. They don’t. Creative stuff that was also useful and fun. So why are they cut?! Assets: 95% of the art from old Dungeonmans has been updated, recreated, or just straight tossed. Each of the traps would need new sprites that matched the bar of the rest of the game, and there wasn’t time for that. Especially the smoke clouds and rolling fire traps. It’s not impossible but time and resources are finite things. Intelligent Placement: Traps were kind of random in how they were placed. Sometimes that’s ok, but a good trap is better when it’s placed in a way that makes players have to think about the next move. Take a shortcut but risk setting off something that can knock you backwards, guard a treasure chest with a series of traps, a superstrong monster that can knock you into a spiked wall. You’d want monster AI to have some basic knowledge of active traps, and the more clever ones would send players in that direction. Fun Interactions *Besides* Setting Them Off: With the trap system as is, there were three options: jump over it, power through it, or attempt to disarm it. The disarm system was a straight dice roll that used your stats and your ranks in a thievery skill to determine success or failure. It was subpar. The thievery skill had one real use: traps, and that made it way less appealing than everything else. You could put your skill point in leaping across the room, launching a ray of frost, oooor a 10% boost to trap discovery and disarming. * Disarm traps and scavenge for parts? Recover poison darts or blades to toss? * Detect traps with a spell? Disarm them with a spell? * Place their own traps? All of those things fit nicely into the Kitchen Sink that haunts every roguelike developer. “This game will have everything!” I had to consider where features like that landed when compared to others, especially through the lens of the fancy title, Dungeonmans: The Heroic Adventure Roguelike. Indiana Jones is a heroic adventurer, and he dealt with traps all the time! Of course, he never had to face down the atonal dissonance of Dread Purpleonians either. Protip: whip proficiency is a poor choice there. 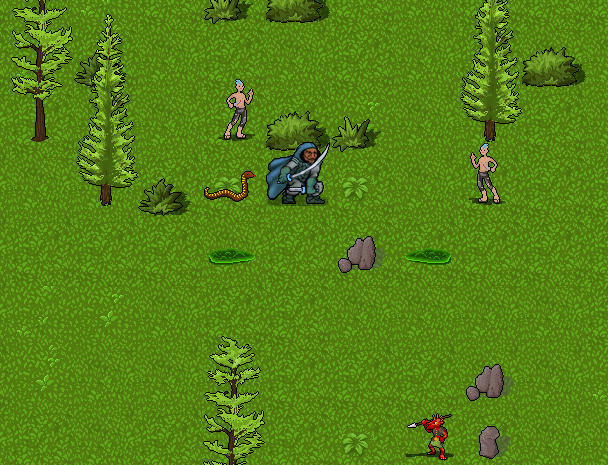 Here’s a shot of a Field Battle, a random encounter while moving across the plains. This is still early on, the foes aren’t terribly strong but you certainly don’t want to be surrounded. Here, the Lady Wizardmans Bluebelle is taking on a Punk Roadblock. These hooligans think they can just run wild and own the only roads between towns? You’ll notice a few things in this shot: there’s burning terrain from the vials thrown by Gutter Chemists, and that fire will damage anything, including the wooden barricade. Near the top of the screen is the Droog Captain in charge of the operation. The red glow indicates he is a Champion, a dangerous foe far stronger than the regular variants. Finally, here’s a shot of a dungeon tileset I haven’t shown off much. Here our heroine is holding to the doorway, trapped between an encroaching Puppy Mold and “fearsome” Scrobold Jabroni. Not really much to worry about here, honestly. That’s it for this week. Crazy Dungeonmans development crunch continues, with the exception of the 3-4 hours next week I will spend with a bowl of popcorn watching E3 streams!